On our way home from the quilting retreat we stopped off at a couple of shops. One, which shall remain nameless, gets my nomination for Basil Fawlty shop of the year. You know the sort of thing – this would be a great shop if it wasn’t for those irritating customers. It started at the shop door and a sign instructing us that if our shoes were muddy we should take them off to enter the store! Once inside there were signs everywhere. The assistant was helpful and friendly but the tone of the signs was not – “We only cut a minimum of a metre. If you want less look on the pre-cuts table.” And on the pre-cuts table words to the effect – “Don’t open the packets if you want to see the design, look at the fabric on the bolts” and “Don’t upset the numerical order of these pre-cuts”! Needless to say we didn’t buy anything. Our next stop was Timeless Threads in Mittagong. This is a lovely shop with very friendly and helpful staff. 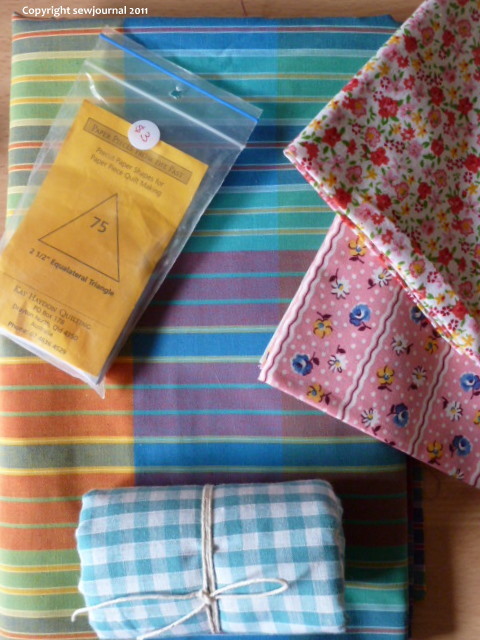 Di(3) bought quite a lot of very interesting pictorial fabric here but my purchases were more modest. The end of a bolt for $10, two $3 fat quarters, a length of gingham and some triangle paper pieces. Well, that’s a huge downer 😦 Some shops just don’t know how to keep customers. I can understand the need for their signs, but, really! I only went to my LQS once and never went back. No selection, and the one lady working, I don’t think she even sewed. There were no classes or examples, or anything. i hate getting talked down to by businesses that then expect me to give them money. but i ❤ fawlty towers!! !